Ganton, ranked in the top 30 of Europe’s Championship courses, has hosted many national and international tournaments and is a perfect place to play golf. Nestling in the Vale of Pickering, east of York and a few miles from the coastal resort of Scarborough, a day at Ganton is a day to remember. 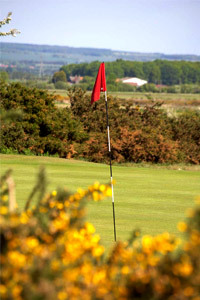 The terrain is sandy and gently undulating – a blend of links and heathland. The fairways are firm and fast. The bunkers are cunningly placed and sometimes cavernous - and the greens are perfection, in summer and winter alike. The architecture of the course is a tribute to some of the most famous names in golf. Vardon, Ray, Braid, Taylor, Colt and MacKenzie have all contributed to make Ganton the unique challenge it is today. Their efforts have been rewarded many-fold, with the Club playing host to the Ryder Cup, the Walker Cup, the Curtis Cup, the Amateur Championship and numerous other national and international events. Sir Michael Bonnallack, former Amateur Champion and past Captain of the R&A, summed up Ganton well. “The journey from tee to green on every hole is one of the most enjoyable golfing examinations that a player is ever likely to experience”. Whether for a relaxing game with friends or for a larger group of visitors, Ganton knows how to look after its guests. As one arrives along the lane to the Clubhouse there is a feeling of peace which is only broken by glimpses of the bunkers - real bunkers, which as Patric Dickinson described in his classic book 'A Round of Golf Courses' seem to say "Good Morning, we hope to be introduced." The fairways are predominantly bents and fescues, that provide a firm base for all well executed shots. It was said 'the lies at Ganton provide the perfect place to practice one's brassie shots'; not that today's players carry, let alone need a brassie. However, the modern player will find that Ganton puts a premium on accuracy rather than length. Impenetrable gorse abounds within the open nature of the heathland. There are few trees, other than those on the boundaries; with plenty of space, the original open character of the terrain has been retained. As to the bunkers, Ganton has few peers; the player who is bunkered is punished for the error. In an age when golf designers are making bunkers less penal, this is a welcome feature. It is invidious to single out any hole for particular comment: the opening holes make full use of the contours of the land and call for straight driving. 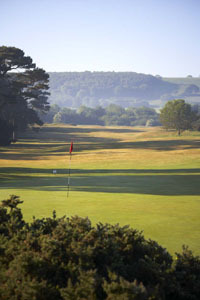 The genius of Harry Colt marks the fourth as one of the best holes on the outward half with its shot across a valley to a plateau green, the gorse behind punishing less than a perfect shot. The seventh (435 yards) is a fine dog-leg hole with a great nest of bunkers filling the dog-leg angle. The ninth is the second of the three Par 5s and is marked by a smallish green, guarded by bunkers and gorse, which present a difficult target to a long second shot. 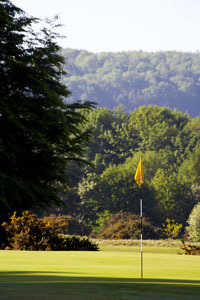 The wind is always a factor at Ganton with the varying direction of the holes. The tenth, the second of the short holes, calls for a well judged shot, particularly if the wind is swirling over the green. The next four holes can be tempting to the aggressive player before the very demanding finishing holes, which are difficult to beat anywhere. The fifteenth and sixteenth are stiff two-shotters both requiring perfectly struck shots to subtle greens. The seventeenth is a long one-shotter which is harsh in the punishment of a wayward shot. The finest hole is possibly the eighteenth, requiring an accurately placed drive to give a clear shot to the sloping, well bunkered green. Championships have been won and lost on this hole for it sums up the principle of the whole Ganton layout; you are forced all the time to a choice of risks, if you are to achieve par.